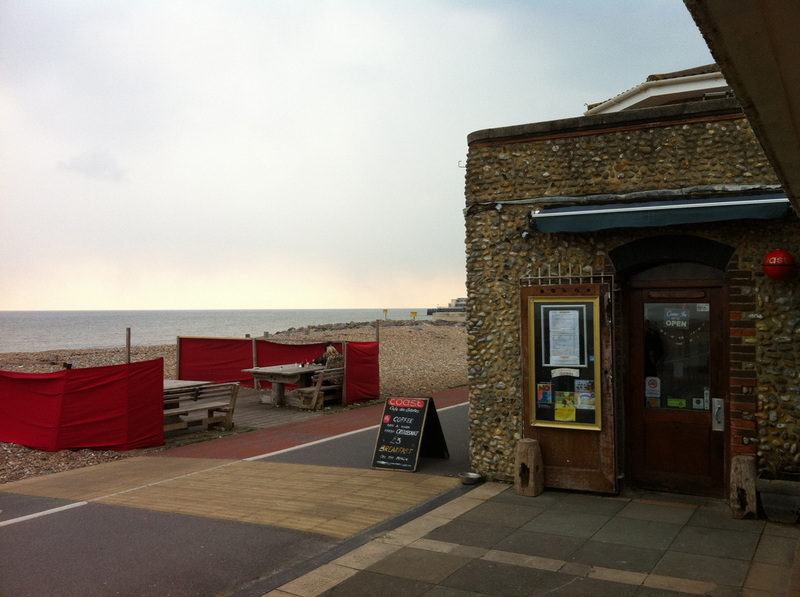 Strolling along the Worthing seafront on a bright and blustery spring day, drawing in lungfuls of invigorating ozone-laden air, past the pier heading east, ingénu/e magazine came across Worthing’s most unusal café, Coast Café des Artistes. Coast is quite a unique beachside cafe. Its internal setting is very laid back with driftwood worked into the walls and a billowing sail ceiling. The food, also, is not your ordinary beach fare; still fish and local meat on the menu but much more geared towards vegetarian dishes, all very well put together by a good team of chefs. The coffee stands out, as does the carrot cake, but what is so lovely is where it sits on the beach. Here at East Beach it’s quiet – no road, only bikes sail past, and you can eat on a protected deck right on the shingle whilst the kids play in the new playground round the back. Alongside the cafe stand a row of beach chalets dating from Worthing’s heyday in the 1930s. 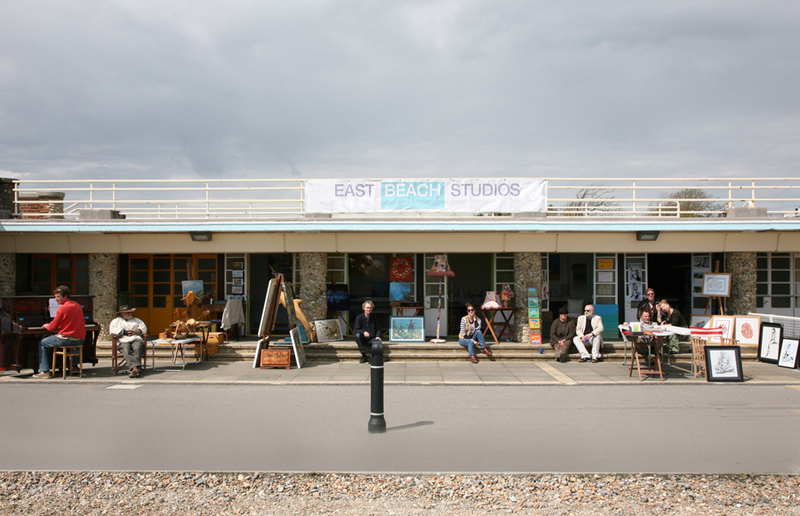 These have been re-invented as East Beach Studios and are occupied, not by the bucket and spade brigade, but by working artists and makers. 1% for art was a core aspect of urban regeneration in the 90’s. The idea of putting the development of art and the creative industries at the heart of a regeneration plan is still not entirely agreed upon. The art studios developed next to Coast Cafe des Artistes down on Worthing’s eastern seafront may finally silence the naysayers. Three years ago Stefan Sykes, who runs Coast, managed to wrestle five beach chalets from the Borough with the argument that, although he existing users were paying their rental, they were absent more than 95% of the time. Worthing now boasts some unique first-step studio spaces for budding artist-entrepreneurs alongside creating an enjoyable visitor attraction on the seafront. With over 3000 people walking past now on a sunny weekend and many estate agents using the studios as another reason for selling Worthing, there’s no wonder a waiting list of over 60 artists sits in Stefan’s hands. A further group of artists have set up Worthing Art Studios on a site in Great George Street too and are enjoying success and a plan for Worthing Hub – a shared workspace development for creative and digital companies is being worked up by the Borough. 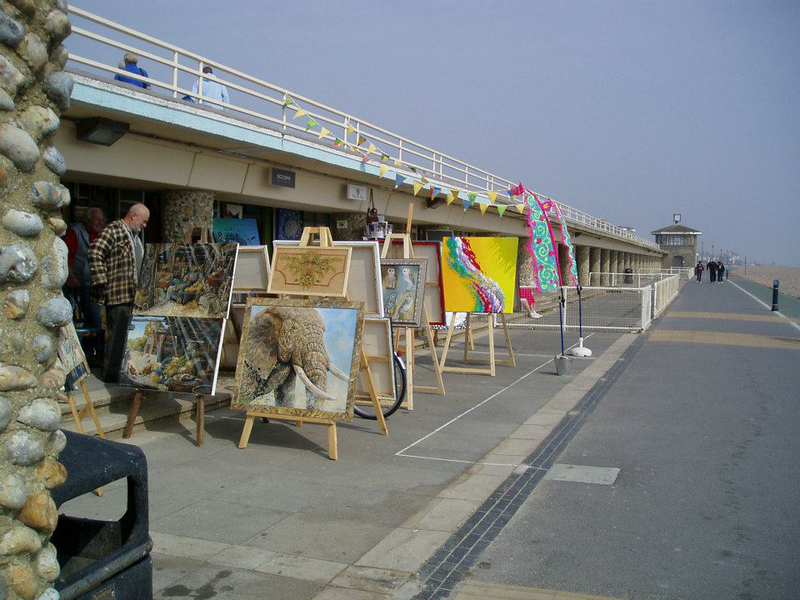 There is now confidence in Worthing to use art and creatives to give the town a new direction for progress.